We know. RIX CAFE TEXICAN sounds like a restaurant, but it isn't. It's a very small publishing company. So small, we only publish one writer. Me. Gretchen Lee Rix when I'm writing romances, and Gretchen Rix for when I'm writing mysteries, weird Westerns, short stories, science fiction, fantasy, action-adventure, and someday, pirate tales. 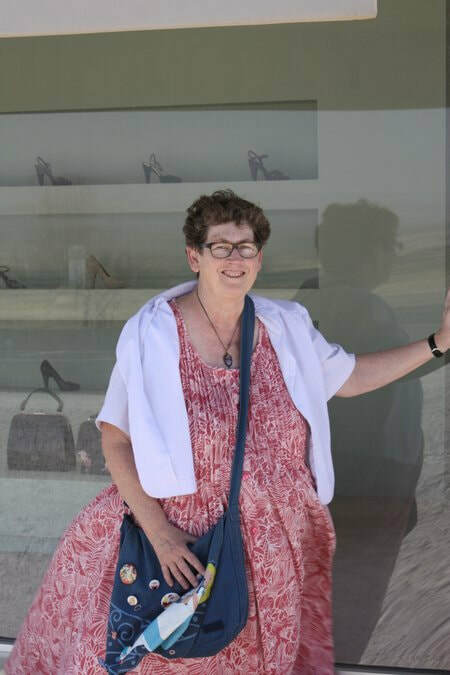 My sister Roxanne Rix is the other half of our publishing venture. The name is an homage to one of my favorite movies, Casablanca. As in Rick's Cafe American. Fulfilled one of my childhood ambitions with this name. And it only took five years, but finally we don't get calls from people wanting to sell us credit card machines and restaurant equipment. 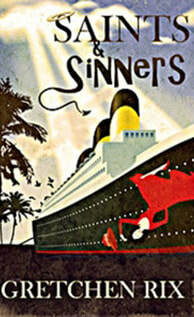 E-books of my novels and stories are available through the usual suspects. Our covers are by Streetlight Graphics. 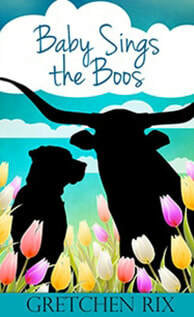 Indeed, the bull, dog, and zombie in tulips scene over there is the original background digital painting for Baby Sings the Boos. We have ten audio books of my work now. The last one has just been released. ILL MET BY MOONLIGHT masterfully narrated by Emmy-award winning actor Bill Oberst Jr, seen here. You don't want to miss this one. He doesn't just read the stories, he brings them to life. ​Having her will cost Junyur Wilde everything else he’s ever wanted. Letting him go will force May Ling back into the whorehouse she’s hoping to escape. 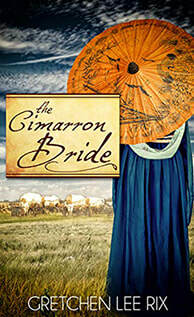 The Cimarron Bride is their story, a western romance set against the backdrop of the very last Oklahoma Land Race. Cannibals. Man-eating lions. Crocodiles. Pygmies. Monkeys. Lost Cities. Lots of naked people. Mr. Bryce, the best Great White Hunter of them all, rues the day he ever met one Miss Gafford from Texas. Darkest Africa may never be the same. 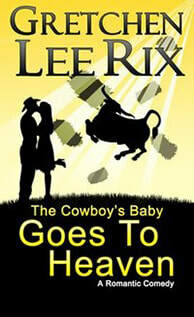 The second in The Cowboy's Baby series, is a story about taking chances, seeing people for who they are, and one very, very stubborn bull. 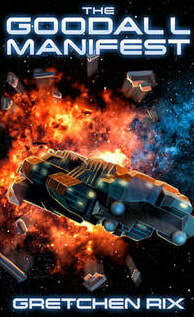 ​All that stands between Captain Carmady and an exceptionally ugly death is his First Lieutenant Joan Chikage. And she will not budge. 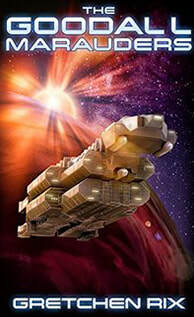 The Goodall Marauders, book three in the Goodall series of science fiction mysteries. All the normal sounds usually reaching the lower decks of the USS Goodall during routine subspace flight have just been cut off. 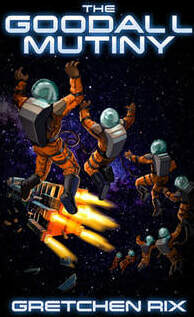 Marooned, with failing systems and inexperienced officers, the dangerously dysfunctional crew must fight to survive. Could surviving be a fate worse than death? First in the Goodall series of science fiction mysteries. She’d quelled the mutiny. Discovered the murderer. She’d even brought in Van der Ryn so he could pay for his crimes. She’d kept everyone alive when they probably should have died. Except for Leichter. And Praetor. And Running Wolf. She’d saved the cat, damn it! How could she have ended up back where she'd started? Book two in the Goodall series of science fiction mysteries. Trees don’t walk. But here they do. In ILL MET BY MOONLIGHT they walk, they kill, they eat people, and then they— Nope. Telling you more would spoil the fun. Welcome to this horror collection about the walking macadamia nut trees of Hawaii. Believe it or not, you’re going to laugh. A new addition to the humorous horror genre. Enjoy. timey British mystery novel, but set it in Texas and put some barbecue in it. The braver the mouse, the better the supper. Not every house cat’s slogan, but Paw Paw likes them feisty. Cats eat mice, you know; even in stories. 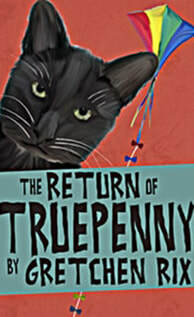 Inspired by a true story, this is the oddly endearing tale of how an old housecat becomes the BFF of the young mouse Truepenny, and of how their lives are changed forever by their adventures. 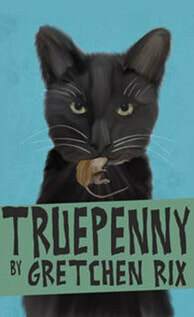 This second in a series sees the return of the beautiful, brave and resourceful mouse Truepenny into the Scheherazade-like tales of her BFF Paw Paw the housecat. An angel of God who can't remember his purpose. Two legendary lovers. Three strangers unite, battling one another and the ancient menace one carries unknowingly on her back into the West Texas arroyo. not your grandfather's sort of western. Passengers party like hell, no thoughts of the future. What's so bad about spending the rest of time immemorial on a cruise ship, someone asks? 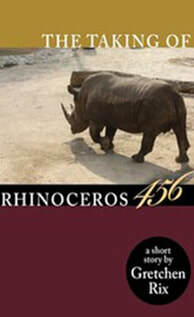 Find the answer in this black comedy short story. Something mysterious goes on after hours at the San Antonio Daedalus Memorial Zoo. Myths live here. Mother Earth, for one. When the rhinos vanish, Steve the bum finds a talking dog. Maybe. Oddball whimsy combined with a puzzle. This young black girl's survival depends on her dental health; yours on keeping out of her way. Whether you like your horror stories nasty or merely scary, this one leaves your teeth on edge. 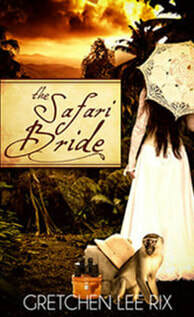 KDP author Gretchen Lee Rix reads a lot. She also watches too much television. She writes novels in her spare time, figuring that anyone with such a splendidly boring life as hers would have to have a fantastic imagination. 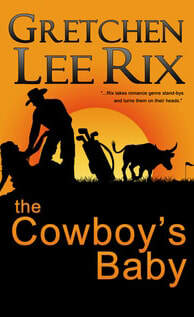 From this premise Gretchen has concocted the contemporary fairy tale-inspired romantic comedies THE COWBOY'S BABY and THE COWBOY'S BABY GOES TO HEAVEN. There will be a third novel in this series. Sleeping Beauty figures heavily in the first book, Puss in Boots in the second. And believe it or not, both books are romance novels. 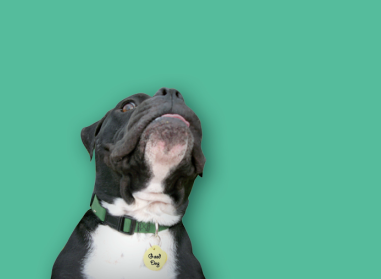 The Boo Done It series features the Rix family's American mastiff dog as one of the main characters. 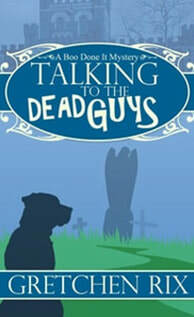 TALKING TO THE DEAD GUYS exposes the barbecue capital of Texas (that's Lockhart to everyone else) to murder and mayhem and enough humorous predicaments to make readers laugh out loud. 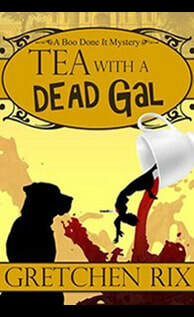 TEA WITH A DEAD GAL is the second in this series. She has plans to write the Boo Done It mystery series until she runs out of ideas. And Lockhart is a very interesting little town. 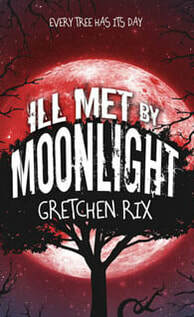 Gretchen is a member of Romance Writers of America, The Irving Club, and Netflix. 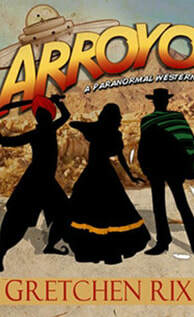 ARROYO, her stand-alone venture into the weird western genre, is her second piece of horror writing. 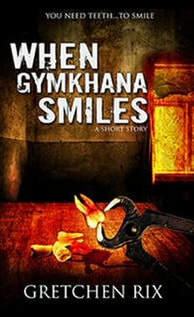 WHEN GYMKHANA SMILES, a short story, was her first. 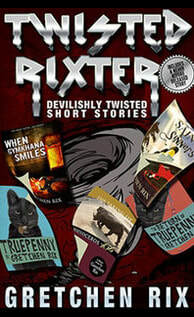 Most of her other published short stories fall into the whimsical fantasy category. You can read more on her blog at gretchenrix.com or her facebook page. Contact us to learn more about our books and other recommendations. Thank you for stopping by!